Tis the season to shop with mobile! Hard to believe the holiday season is right around the corner. Soon shoppers will be gearing up to find the perfect gifts for their loved ones. And according to eMarketer, they will be shopping online and on mobile. Are you prepared for the ecommerce shopping frenzy?! in-store, it's where 91% of holiday transactions take place! Not sure you're ready to handle a surge in online and mobile shoppers? Don't panic! 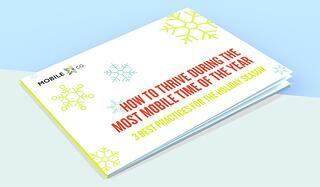 We've put together 3 best practices to help you thrive during the most mobile time of the year. Actively engage shoppers on mobile and build a list. Remember, for effective messaging you need to target shoppers at the right time, with the right message, and the right content. - Offer fun contests as a way to encourage participants to subscribe. - Send friendly mobile reminders about sales and promotions. - Provide easy to redeem and trackable coupons to help drive in-store traffic and online sales. More and more shoppers begin their search for the perfect gift, on mobile. It's important to optimize your content for mobile to enhance the consumer experience. Mobile will account for 1/3 of ecommerce this holiday season. - Minimize website response times for mobile users. - Search and menu options should be easily accessible on all pages. - Provide live chat and SMS messaging to answer customers’ questions and update order details. Did you know? 67% of shopping carts are abandoned. We want you to join the “no shopping cart left behind,” movement and keep your checkout process simple. - Offer guest checkout for those shoppers in a hurry. - Limit the number of form fields required to checkout. - No hidden fees! Provide the total cost, including taxes and shipping, up-front. There you have it, 3 best practices to help you thrive with mobile! To recap: Build a list and reach customers with effective messaging, optimize for mobile and enhance customers' user experience, and keep it simple to make it easy to buy from you. Don't wait, get started today and make the most of your mobile shopper's experience. Keep these best practices on hand, download our free eBook.